We are happy to announce that we’ve extended the functionality of Syntaro Application Management to include user communication and notification. 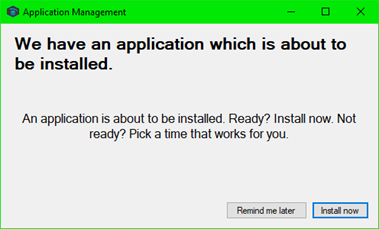 This can be very helpful when you need to interrupt the users for an urgent update or simply to inform them of a planned installation. You can also allow for a delay of the installation or force users to shutdown running applications that need updating. The main functions for the communication are PowerShell addressable and part of Syntaros extended base-script functionalities. So please be aware that you’d need to update the basescript on all your clients to profit from this new feature. It also requires a small component to be installed on your clients, this can be distributed through Intune of course. We’re working on a way to allow a forced shutdown of several applications at the moment it’d require one notification per application shutdown. We hope you enjoy this little additional tool and wish you good luck with the implementation. If you need support beyond the above, don’t forget about our Syntaro Application Management SLA offers. You’ll find them in the marketplace.